Sometime in the 1950s, Emiko Davies' nonno-in-law began the tradition of ringing in the new year with tortellini al sugo. He served it along with spumante and a round of tombola, and sparked a trend; up until the 1970s, you could find tortellini at midnight on New Year's Eve in the bars around the Tuscan town of Fucecchio. This is just one of the heirloom dishes in this collection, for which Emiko Davies has gathered some of her favourite family recipes. They trace generations that span the length of Italy, from the Mediterranean port city of Taranto in the southern heel of Puglia to elegant Turin, the city of aperitif and Italian cafe culture in the far north and, finally, back to Tuscany, which Emiko calls home. 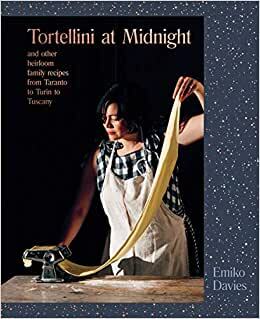 Tortellini at Midnightis a book rich with nostalgia, with fresh, comforting food and stunning photography. It is a book that is good for the soul. Start reading Tortellini at Midnight on your Kindle in under a minute. Born in Australia to a Japanese mother and a diplomat Australian father, Emiko Davies has spent most of her life living abroad – her adolescence was spent in China, she attended university in the United States and now, for more than a decade, she has called Italy home. She first fell in love with Florence as a twenty-year-old art student. When she couldn’t get the city out of her head, a few years later she returned to study art restoration and photography and soak in the Florentine lifestyle (learning Italian along the way). It was then that she met Marco and the pair got married. Marco became a sommelier and Emiko started writing a food blog dedicated to telling the stories behind regional and historical Italian dishes, as well as their travels and family life in Italy. Tortellini at Midnight is her third cookbook after Florentine and Acquacotta, which both focus on the traditional, regional dishes of two beloved Tuscan places: Florence and the Maremma, respectively. Emiko continues to write about food and travel within Italy on her blog, as well as for popular New York–based website Food52, and for publications such as Gourmet Traveller and Conde Nast Traveller. She lives in Florence with her husband, Marco, and their two young daughters. This was ordered by mistake. I don’t have a kindle. Emiko's writing has held me in its seductive grip since I reviewed her first book, Florentine. I found serenity in her words and recipes. Her second title, Acquacotta (a celebration of the traditional cuisine of a lesser known part of Tuscany, the Silver Coast) was equally as brilliant. I would think that one would not be able to continue to create such beauty time and again, but I would be wrong. Emiko's latest is perfection with vivid storytelling, stellar photographs and recipes that will inspire and lure us into the kitchen. This is an Eat Your Books digital title. Tortellini at Midnight is a book that will be handed down to children or gifted to those we truly love. There is an old-world quality and elegance to the actual pages of the book. Couple that with the exquisitely written narrative, stunning photography and rustic but elegant recipes and you have a book destined for deserved accolades. The first recipe that I made from the book was the Pasta con la ricotta (photo above) a dish that took the time needed to cook the pasta, but resulted in a delicious and comforting meal. This book is everything a cookbook should be - beautiful, interesting, informative and delicious.